In February and March 2011, The Edinburgh Community Backgreens Association (ECBA) will be run­ning a FREE Community Gardener train­ing pro­gramme, cov­er­ing all the skills you need to become a fully fledged com­munity garden­er in your neigh­bour­hood. During the course of the train­ing, we will estab­lish a com­munity garden­er net­work so the par­ti­cipants can sup­port each other’s pro­jects after the train­ing has fin­ished. This train­ing is for any­one who is involved in com­munity garden­ing pro­jects, or any­one who would like to start or get involved with a pro­ject. The par­ti­cip­at­ory approach to train­ing means that we will draw on par­ti­cipants’ var­ied know­ledge and exper­i­ences to learn. Hi, we just wanted to let you know what happened at PEDAL’s recent Local Food Links event, and our plans for the next event — where we hope lots of loc­al people will come along to start work­ing togeth­er for loc­ally-pro­duced food grown and sold here in Portobello. On Tuesday 23rd November in the Community Centre, Heather and Pete of Whitmuir Organics hos­ted a dis­cus­sion on loc­al food in Portobello. A group of 16 loc­al people got togeth­er to cre­ate a vis­ion of a fant­ast­ic food future for Portobello … loc­ally-pro­duced and organ­ic … then work out how we might get there. Have a look at the map we cre­ated, and the dia­gram sum­mar­ising the cur­rent PEDAL Food groups and pro­jects, which is on the Food page of this web­site. We are hold­ing a fol­low up event on Tuesday 25th January from 7 – 9pm. We want to bring togeth­er as many people as pos­sible who have been involved in PEDAL’s food pro­jects — wheth­er that’s the orch­ard, mar­ket, food grow­ing courses or whatever — and people who are inter­ested in loc­al food but haven’t yet man­aged to get involved. Folk will be able to choose the top­ic they’re most keen on and work with oth­ers to plan what can be done over the next year. We hope to see you there! Details of the ven­ue will be pos­ted on the web­site and emailed to all those who expressed an interest. On Saturday 18th of December, 2 — 4pm, PEDAL held a Winter Solstice Celebration at Donkeyfield Community Orchard. Around 40 people came along to cel­eb­rate this most sea­son­al of events, includ­ing sev­er­al folk who had nev­er been to the orch­ard before — not bad for sub-zero tem­per­at­ures. The trees were was­sailed in fine fash­ion (thanks to Gordon for the loc­al cider, and Mairi for the song from the Winter’s Night con­cert), Peter brewed up some fine mulled wine and cre­ated a fant­ast­ic­ally warm­ing fire, Beth told a great story and some lovely lan­terns were made. Local Food Whatever the weather! The December Portobello Organic Market was a sunny snowy suc­cess des­pite the win­tery weath­er and most oth­er events being can­celled. We brought fresh bread, veg, meat, fish, cakes and gifts to Portobello when everything else seemed to be run­ning out. The Christmas Hamper Treasure Hunt went down a storm as well , with great com­pet­i­tion devel­op­ing to find the hid­den golden apple. The lucky win­ner of the hamper was Andrew Paton, so con­grat­u­la­tions to him and thank you so much to all the stall­hold­ers who con­trib­uted pro­duce. 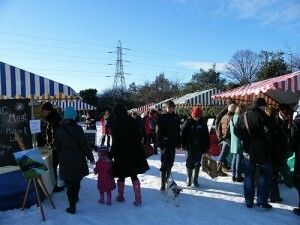 Have a very merry christ­mas and remem­ber the first Portobello Organic Market of 2011 is on February 5th 10am — 2pm. Still bring­ing you lovely loc­al pro­duce des­pite the win­tery weath­er! Our it’s nearly Christmas Market! Come along and buy christ­mas dec­or­a­tions, presents and fest­ive treats! Don’t for­get you can also order deliv­er­ies of fruit, veg, and meat for your christ­mas din­ner. 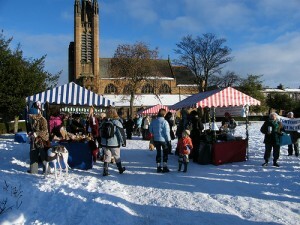 There will also be Christmas Carol sing­ers (11−12) and a christ­mas treas­ure hunt to win a Porty Shopper of good­ies. 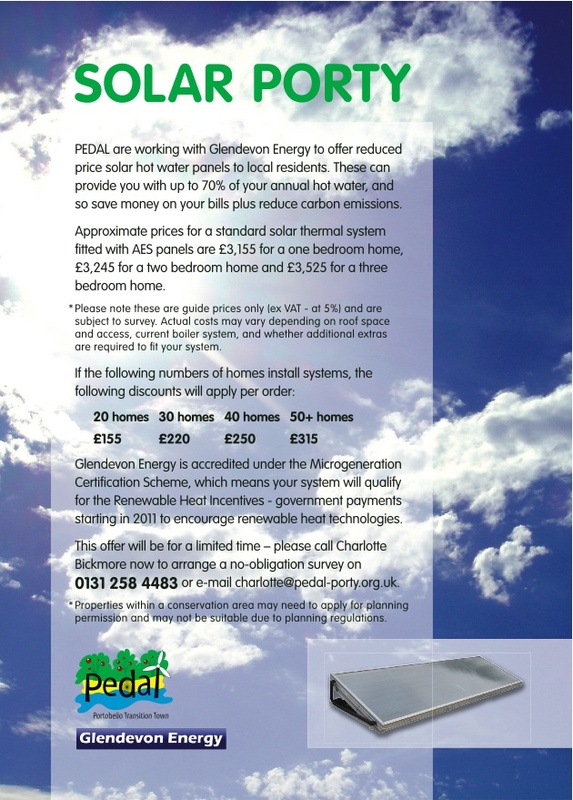 PEDAL — inform­a­tion about PEDAL pro­jects and a chance to buy a Fruitful Porty fruit tree, receive a free home energy check & lots more! Don’t for­get we want this mar­ket to be the best it can be and feed­back from loc­al people attend­ing the mar­ket is essen­tial. There are feed­back forms at every mar­ket or you can just add com­ments here, about what you would like to see, great things, not so great things… If you would really like to sup­port the Portobello Organic Market, we are look­ing for volun­teers to help man­age the mar­ket. You can stew­ard for a few hours on the day, help to decide which stalls we have and what the market’s pri­or­it­ies should be, as much or as little as you like. PEDAL are look­ing at vari­ous ways in which a strong loc­al food sys­tem in Portobello might be developed. We are hop­ing to find out what res­id­ents of Portobello feel about buy­ing loc­ally pro­duced food. By loc­ally pro­duced food, we mean food that has been grown, reared, caught, baked or oth­er­wise made in Scotland (prefer­ably the south-east of Scotland). The pro­duce cur­rently sold in loc­al shops may or may not have been pro­duced loc­ally. In par­tic­u­lar we would like to know what makes it dif­fi­cult for people to shop this way and how it could be made easi­er. This sur­vey will only take a couple of minutes but will be very use­ful when decid­ing how to take this work for­ward. It would be great if you could take the time to com­plete it as everyone’s opin­ion counts. Please also for­ward it to any Portobello res­id­ents that you know. We have even MORE STALLS this time, with new stall­hold­ers and old favour­ites. Apple Day feedback — how was it for you??! We had a won­der­ful Apple Day/ Halloween cel­eb­ra­tion on Saturday 30th of October, with near per­fect weath­er, a bon­fire, many pounds of apples being juiced, tof­fee apples, peel­ing com­pet­i­tion, Splat the Rotten Apple and folk turn­ing up in won­der­ful fancy dress. Many thanks to all who came and to all who helped. However, if you were there, we’d be very pleased if you would take a moment to send us your com­ments and feed­back. What did you like ? What would have made it bet­ter? Are you likely to join in future com­munity events at the orch­ard? Woteva! — we look for­ward to hear­ing from you.